CUSG ensures the student voice is heard in UMC funding decisions through seats on the UMC Board. The Rec Center offers a variety of high quality, convenient, innovative and inclusive ways to help students connect with themselves and their campus community through fitness. The Rec Center enables students to explore and try something new from ice skating, indoor rock climbing, team sports, yoga, enjoying the Buff Pool and so much more. CUSG ensures the student voice is heard in Rec Center funding decisions through seats on Rec Board. CSI cultivates an environment for building vibrant, engaging and safe communities through programming, leadership development, cultural awareness and learning opportunities. It also serves as banker, bookkeeper, travel agent, and more for student organizations. CSI oversees departments such as Program Council, and organizes events like the Be Involved Fair. CUSG ensures the student voice is heard in CSI funding decisions through seats on its cost center board. The Environmental Center supports the educational mission of the University by providing information on sustainability issues to students, faculty, staff, and the community. The E-Center provides direct services to the University community, including the recycling program, the student bus pass and bicycle programs, and energy conservation and renewable energy programs. It also sponsors educational events. CUSG ensures the student voice is heard in E-Center funding decisions through seats on its cost center board. 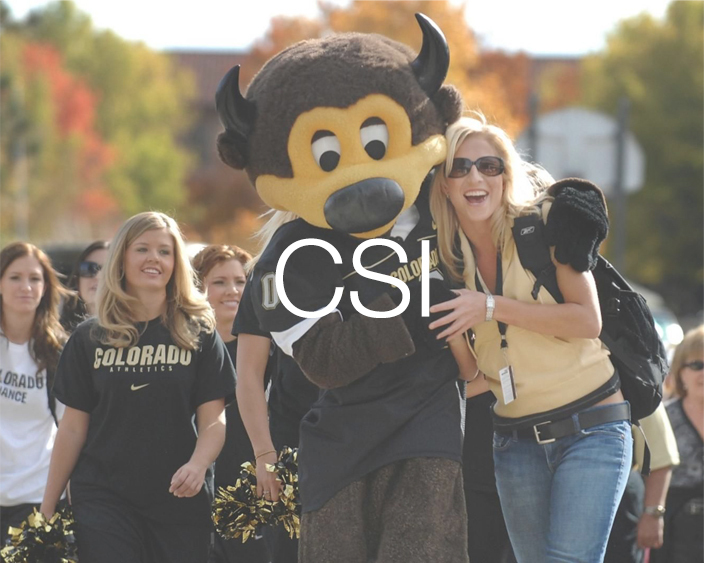 CUSG is the official governing body of the nearly 34,000 students at CU Boulder. From student organizations and clubs, passing legislation to better the lives of students, to representing the student voice on joint boards and overseeing facilities, CUSG seeks to make a meaningful impact on the lives of CU Boulder students. Funding for CUSG covers expenses such as events, student organization funding, payroll for CUSG staff, elections. CEB believes that a university experience is more than simply showing up to class. At the University of Colorado, students are given the chance to enrich their educational experience through opportunities that develop their understanding of culture, diversity, and social awareness. 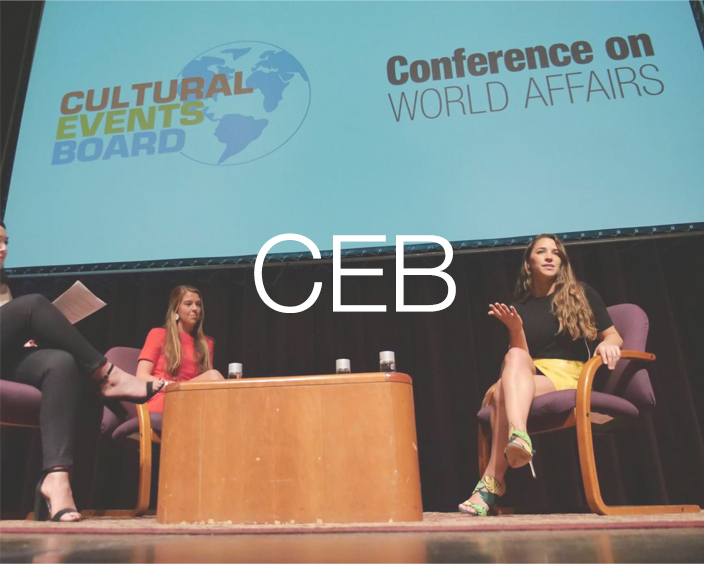 CEB puts on events such as the Conference on World Affairs and hosts speakers such as Aly Raisman and Viola Davis. CUSG ensures the student voice is heard in CEB funding decisions through seats on its cost center board. 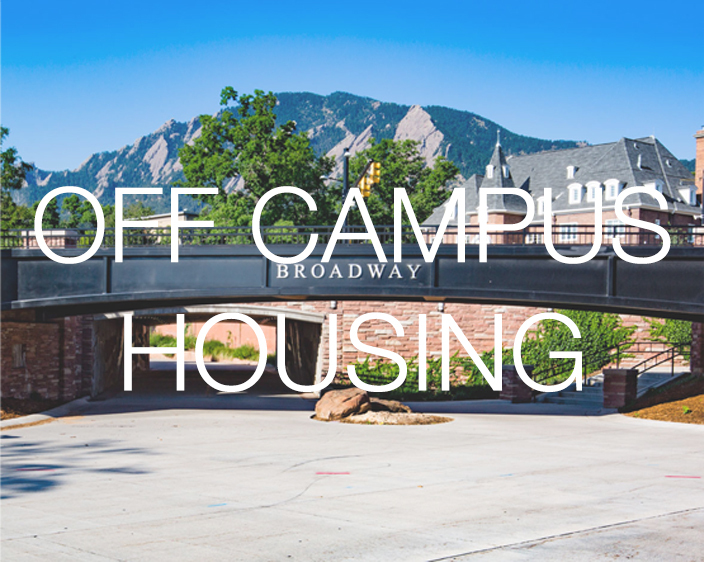 Off Campus Housing maintains listings of rooms, houses, apartments, and roommate requests and provides students with Boulder maps, copies of the Boulder Tenants' Guide, the Boulder Model Lease, subleasing and roommate agreements, furniture rental information, moving tips and other materials related to living off campus. It manages Ralphie’s List and offers students free legal counsel for leasing agreements. Off Campus Housing is funded by CUSG. Legal Services is dedicated exclusively to serving the legal needs of CU Boulder students.provide accessible professional legal assistance to eligible students for a fraction of the cost of a private attorney. Its mission is to help students resolve or minimize their legal situations so that they can focus on school by providing high quality legal services to them through an easily accessible program. Legal Services is a CUSG funded student resource. The Volunteer Resource Center works to build partnerships between the CU Boulder campus community and Boulder. The VRC is dedicated to helping students as well as staff and faculty explore the opportunities and understand sustainable ways in which to create an impact and affect positive social change. CUSG ensures the student voice is heard in VRC funding decisions through seats on the VRC Joint Board. SOAC is a voting body of CUSG that distributes funds to applying clubs. SOAC is headed by the SOAC Chair, who also holds a position in the Executive Cabinet, the SOAC Chair along with SOAC Board members allocates funds for club expenses like food and events. All students can apply to be both the SOAC Chair or a SOAC board member. SOAC is a CUSG organization. Radio 1190 is a CUSG funded student service that serves as the college radio station for CU Boulder. Radio 1190 employs student DJs, and it hosts a variety of events for the enjoyment of students. CUSG ensures the student voice is heard in KVCU funding decisions through seats on Air Board. Distinguished Speakers Board brings speakers of the highest caliber to campus who intellectually stimulate the student body and the surrounding community. DSB has brought such speakers as Madeline Albright, Kofi Anan, B.B. King, Bill Nye and Anderson Cooper to campus for the benefit of students. CUSG ensures the student voice is heard in DSB funding decisions through seats on DSB. CUSG ensures the student voice is heard in decisions made by the individual colleges and schools of CU Boulder.